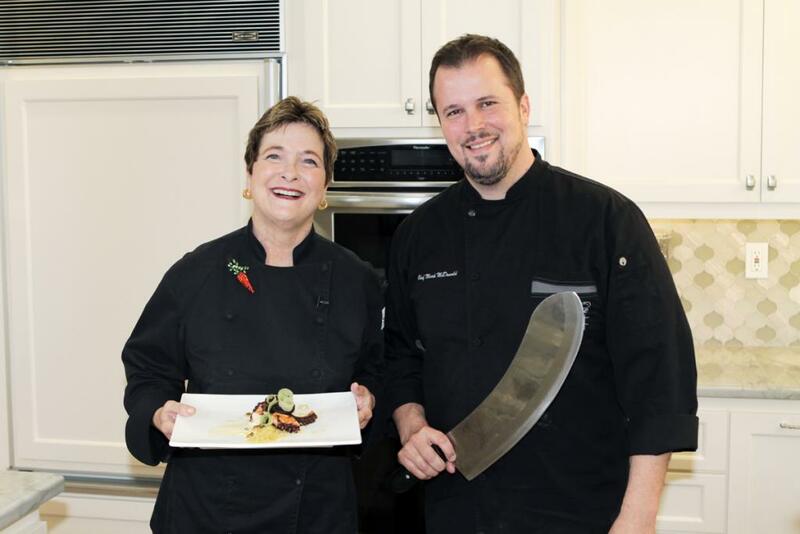 Congrats to Chef/Owner Mark McDonald on Old Vine Café’s tenth anniversary. 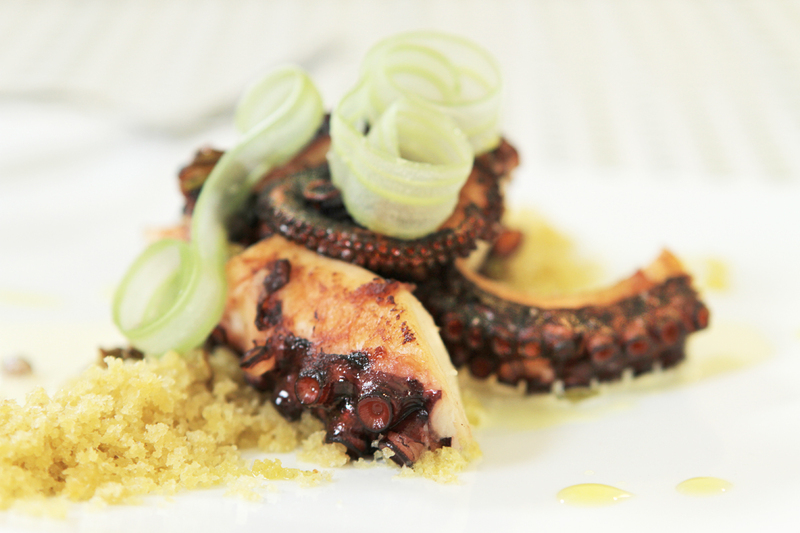 Now let’s cook up that simple octopus dish with Meyer Lemon Emulsion and Sourdough Sand. Ten years ago, Chef Mark McDonald opened his award-winning restaurant, Old Vine Cafe in Costa Mesa. His alluring menus reflect a commitment to regionalism and the use of upscale seasonal ingredients. Dinners can be wine-centric, while breakfasts and lunch dishes note a slightly more casual approach. Some offerings showoff his adventurous side, such as 19-hour slow-braised goat shoulder that is shredded and put into an omelet filling along with pepper jack cheese. Or braised rabbit mole accompanied with a cashew-poblano mole, plus queso fresco and freshly-baked cornbread. Others, perfect yet more mainstream, pair mac and cheese with tempting porcini mushrooms, or filet mignon with crisp onion rings and Maytag demi cream sauce. McDonald is leading culinary tours to Italy for the seventh year, taking groups of hungry travelers to experience hands-on cooking lessons from master chefs, winery and agriturismo visits, as well as multi-course meals that showcase local cuisine. He collaborates with Master Chef John Nocita at the Italian Culinary Institute in Calabria to offer a choice of two itineraries, a tour of Southern Italy (Calabria and Sicily) or Northern Italy. 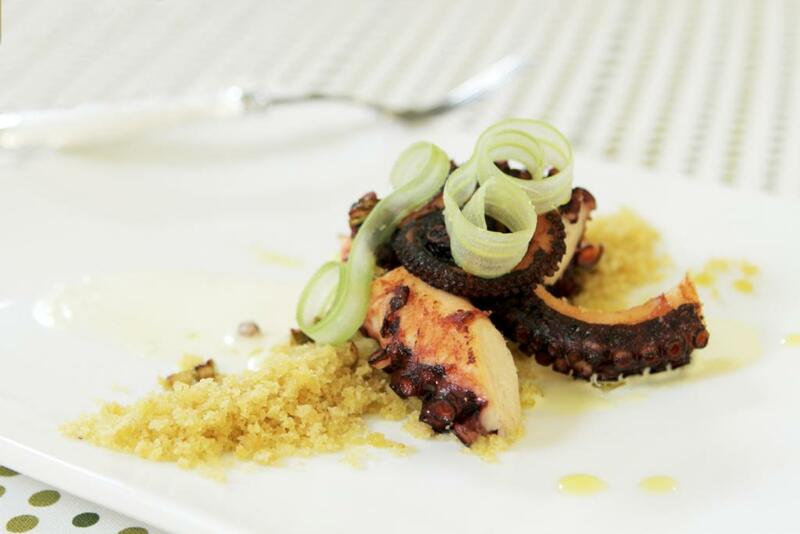 He joined me in my kitchen to prepare braised and seared octopus teamed with a Meyer lemon emulsion and sourdough “sand.” The approach is simple, but requires a couple of hours to cook the octopus, a process that turns the tough rascal into a tender chew. For home entertaining, most of the work can be done ahead. The octopus cooked and cut. The celery prepped. The butter clarified. The sourdough crumbs prepared. At the last minute, all that is needed is a quick blender-made emulsion sauce and a speedy octopus sauté. Secret Talent: He can carry a tune, and with enough alcohol, he lets others listen. Roots: Born in Long Beach, but he grew up in Huntington Beach. Drinks of Choice: Either tequila anejo or single malt scotch, preferably Oban 14 because it’s not too smoky or too sweet. Cook’s notes: To clarify butter, slowly melt 1/3 cup butter in a small saucepan. Set it aside until the milk solids settle. Spoon off any solids that rise, then carefully pour off the golden liquid, discarding the milky part in the bottom of the pan. If you prefer, melt butter in a heatproof glass measuring cup in the microwave instead of using a small saucepan on top of stove. Celery ribbons are prettier if they are made in advance. Use a swivel-bladed peeler to cut ribbons into thin lengthwise strips and store in ice water to make them curl. Preheat oven to 350 degrees. Bring a large pot of salted water to a boil on high heat. Dip octopus in boiling water three times, then place in pot; cook at a gentle boil, covered, for 2 to 3 hours, depending on size. Octopus is done when tentacles effortlessly pull away from body. Cool off heat in cooking liquid. Meanwhile prepare Sourdough Sand: Tear bread into 1- to 2-inch pieces and add to food processor. Pulse to create medium fine crumbs. Place crumbs on rimmed baking sheet. Toss with enough oil to coat; season with salt and white pepper. Place in preheated oven; toast until crumbs are lightly browned and crisp (watch carefully because they can burn easily). When octopus is cool, remove tentacles from body. Pull loose skin gently from tentacles and pat dry, then cut on diagonal into 1 1/2- to 2-inch lengths; set aside. Prepare emulsion: Place juice and pinch of salt in blender. Blend on low speed about 15 seconds. Remove lid and with motor running on medium speed, add yolks. Add oil in very thin steam with motor running. Add lid and whirl about 20 second to create volume; set aside. Melt clarified butter in skillet on medium-high heat. Add tentacle pieces and diced celery; cook until octopus browns. Turn and brown opposite side, salting to taste. Deglaze pan with about 1/3 cup white wine, scrapping up brown bits and cooking long enough to evaporate most of wine. Plate: Spoon about 3 tablespoons of emulsion on one side of each of 4 dinner plates; use the back of a spoon to smear across plate. Sprinkle on “sand” in a line that crisscrosses the emulsion. Top with octopus tentacles, diced celery and celery ribbons (shake off water first). Drizzle with a little extra-virgin olive oil. Previous article6 of the Best Happy Hours in O.C.